The Model 3330 In-Line Viscometer provides real-time on location measurement of fracturing fluids viscosity. It is a rugged instrument designed and manufactured to withstand the rigors encountered within field operations. Using Couette Bob and Rotor geometry, the Model 3330 is a concentric cylinder viscometer that meets all API requirements for viscosity measurements of stimulation fluids used in well servicing. The Model 3330 is extremely durable and designed to withstand the harsh field conditions encountered by Frac Crews every day. Full real-time viscosity monitoring during pumping operations may now be achieved. 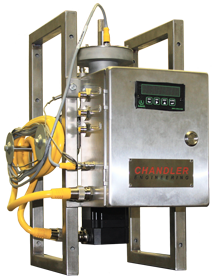 The Model 3330 is a ruggedized version of the 3500 series bench-top viscometer and comes standard with API R1-B1 geometry. This instrument is manufactured to endure the harsh environments in which it is designed to operate. Operating at a fixed shear rate of 511 sec-1, the Model 3330 sends a continuous measurement of viscosity and temperature to a Control Treatment Monitoring Vehicle via 4-20 mA signal loops. The instrument also provides a direct readout of the current viscosity within the front panel display. This state of the art instrument is also available with an optional pH probe for monitoring the pH of the fluid. The Model 3330 is designed for ease of operation and sits on the low pressure side of the Blender utilizing a slip stream flow through sample system off the hydration tank. The instrument is quickly disassembled for cleaning after each run and critical components may be replaced with minimal operator intervention. Check out our video below! See The 3330 In Action!